Subway Squawkers - A Yankees-Mets Rivalry Blog: Is John Sterling's Dean Anna home run call his worst ever? Is John Sterling's Dean Anna home run call his worst ever? I was traveling home from Manhattan last night during part of the Yankees-Red Sox game, so when Dean Anna hit his first home run as a Yankee (also his first MLB homer ever), I missed John Sterling's home run call. I half-expected Sterling to do a "Banana Fana Fo" call from the "Name Game" song. Instead, as I discovered from Facebook friends, Sterling's call was this: "Anna Is on the Dean's List!" Good grief. With all the new Yankees on the team this year, Sterling has much to come up with -- although all Kelly Johnson got was a perfunctory "Kelly killed it" call. 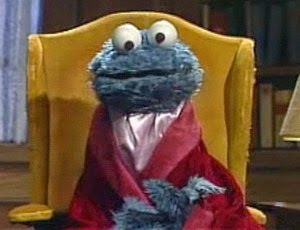 As I have said before, I imagine Sterling sitting up in a smoking jacket late at night, looking like Cookie Monster in "Monsterpiece Theater," sipping a glass of cognac, pen and paper in hand while he comes up with his home run calls. Well, it's finally happening. After more than twenty years of "BERN, BABY, BERN," and "GEORGIE JUICES ONE" - lines that once seemed to roll off John's tongue in the warm ecstasy of a Yankee home run - the Melkman has finally delivered a downside to the business. John is now spending hours in advance, attempting to compose poetry. You can say that's the mark of the true professional that he is. But as a poet, John Sterling is channeling Jewel. And I'm starting to wonder if it's going to bring him down. For starters, John is no longer parceling out home run calls for the home run hitters, which he did at the beginning. (Anyone remember a call for Luis Sojo? Scott Brosius? Mariano Duncan?) The fact that last night Dean Anna - who might have gone this season without a home run - received a ready-made Sterling yelp could be a sign of the final bugaboo of John Sterling's long career: His ego may be spawning terminal self-awareness. I actually like the idea that Sterling has these calls planned out ahead of time. I think it shows a master's dedication to his craft, even when they are thoroughly ridiculous. I was just hoping he would have used the "Name Game" song for Dean Anna. Banana fana fo indeed. Jon is outraged, though, over the headline of this article. He says I am wrong to even suggest that the Anna call is the worst ever. "What about 'Something Sort of Grandish?'" he points out. He's got me there!